Funny thing about winter. At least for me. It doesn't matter how short it is, it's overstayed its welcome. This year we enjoyed a very slow start to the snow and cold. Christmas Day, in the afternoon, our family was actually able to sit outside and have snacks at a bonfire. It was only when the new year arrived that we finally experienced some of what we've come to know as winter weather here in Snowbelt country. I'm not ungrateful. This winter has been a blessing. But, one month of it is more than enough as far as I'm concerned. I believed its slow start would make it feel shorter and I'm hoping that a quick end is in the forecast to ensure that it is. Feb. 2, as most people in North America know, is Groundhog Day. Across the continent at various places there are celebrity rodents that will rise out of their burrow to deliver their prediction for that area. 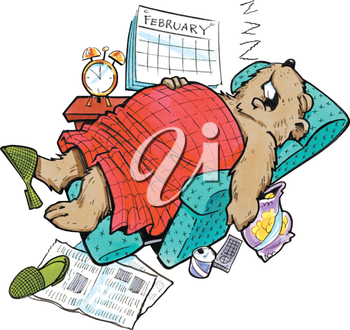 Will the local groundhog see his shadow and announce six more weeks of winter? Or will an overcast sky provide us with the hope of an early spring? So, should our Wiarton Willie come out of hibernation to a dreary dark day and return without seeing his shadow. I will greet the news with glee.